Given the natural flexion/extension movement of the knee as a combination of rolling and sliding during the first 30° of flexion; subsequently the real flexion depends upon the position of the center of rotation. 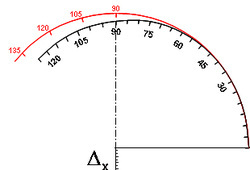 This implies that there is a difference between the knee angle measured with a goniometric sytem and the real distance between the foot and the axis of rotation. After an initial circular rotating phase, the flexion/extension movement of the knee proceeds with a combination of rolling and sliding (rotary - traslational) motion, which is characterized by the progressive decrease of the distance between the starting rotation and the articular surface. The knee flexion/extension axis achieved after a rolling and sliding motion, is different from the axis measured only with a protractor; thus a correct evaluation of the flexion/extension motion of the knee should consider the instantaneous displacement of center of rotation. The position of the instantaneous center of rotation of the knee is initially placed on the x axis as an extension of the longitudinal axis of the thigh, whereas during the full extension of the thigh, it overlaps the longitudinal axis x of the leg itself. In this case the initial center of rotation of the knee coincides with the origin of Cartesian coordinate system xOy. when Rb is the real (effective) radius of rotation changing with the mutation of α, when Rb < Ra. As seen from above, it appears that the rolling and sliding motion the peripheral point P follows a curve with a spiral process, receding toward the center. Therefore the angular reference information on the spiral curve (Fig. 1) must be placed according to the new source xO'Y as a result of the instantaneus shift of the goniometric system along the x axis, when O'= O + ∆x, as a new instantaneus center of rotation.